January 30, 1962 – Officials of the Continental Illinois National Bank and Trust Company announce that the institution will provide nearly $20 million in financing for the first phase of the Carl Sandburg Village urban renewal project. Because of the area involved – east of LaSalle Street and south of North Avenue, near the city’s Gold Coast – interest runs high in the potential for the $42 million project. Projections call for 1,875 units, ranging from efficiency apartments to two- and three-bedroom townhomes located on 15.63 acres between North Avenue and Division Street. Although Continental’s financing plan is subject to the rezoning of the site by the Chicago city council and a commitment from the Federal Housing administration, the chairman of Continental bank, David M. Kennedy says that “the project gives the bank another opportunity to contribute to the development of Chicago.” [Chicago Daily Tribune, January 31, 1962] It is difficult today to think about what a risky venture this was at the time. As the Chicago Tribune reported early in 2018, “Security concerns were high at the development … A block away was Wells Street, lined with raucous bars … The new construction was a $40 million-plus gamble to save the Near North Side and, in turn, to stave off the blight threatening Chicago’s business core to the south and the Lincoln Park neighborhood to the north.” [Chicago Tribune, January 29, 2018] Sandburg Village brought about the gentrification of nearby Old Town, South Lincoln Park and sections of the city west of the Gold Coast. 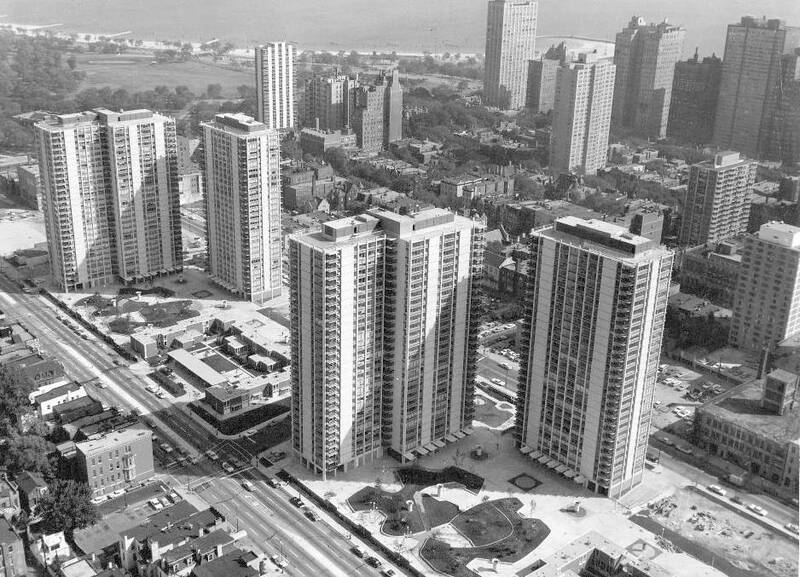 Indirectly, the success of the development led to two other developments in the city that worked in similar ways, Presidential Towers in the southwest Loop and Dearborn Park. January 30, 1947 -- Randall H. Cooper, executive secretary of the State Street council, asserts that redevelopment of Chicago's "blighted areas" is a necessity and that the Loop is "faced with more problems than ever before in its history." The continuing flight of families to the suburbs and the resulting loss of tax and business revenue have the merchants feeling blue. They would get bluer. 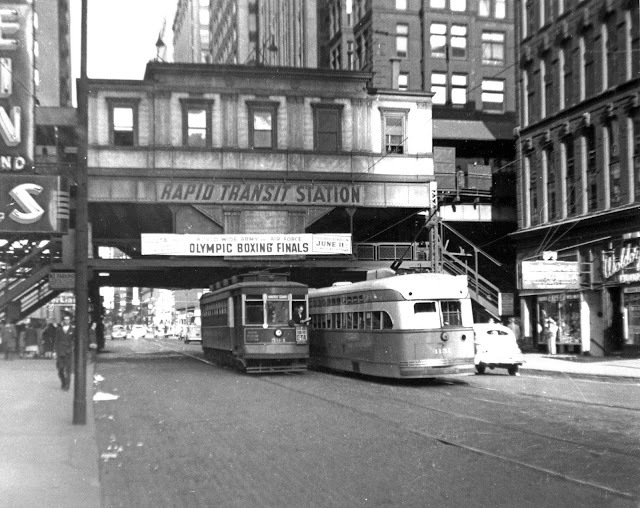 The 1947 photo above was taken at Wells and Madison.